Change nothing and continue consistently. I have to admit that the Lomography.com Colorsplash camera didn’t impress me at first – I have a collection of cheap fixed focus cameras that seemed to do everything the Colorsplash does. The construction and the lens reminded me of a $6 Jazz Jelly. I had seen them at Urban Outfitters and on the Lomography.com web site, and I was intrigued. I picked one up used from a user on the Lomography Livejournal community, and fell in love. 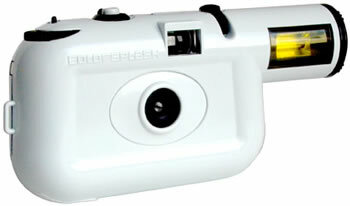 The Colorsplash is different from most film point and shoot cameras. The camera doesn’t have a film exposure counter, which at first seemed out of sorts. After shooting a few rolls through my colorsplash, I find myself concentrating on shooting pictures and spending less time worrying about how many rolls I have left. It’s quite liberating. With a Colorsplash, I just shoot until it won’t advance any more. The camera looks otherworldly, people have no idea what you’re holding in your hand. Take their picture and they’re similarly confused. The colored gels over the flash element always get a response from people, and bystanders suddenly noticing a violet/green/red/yellow flash are not sure what to make of it. The spring-loaded shutter is dirt-simple, and you never have to worry about losing your camera’s ability to shoot if the battery dies. The Colorsplash shutter has a “Bulb” setting, which keeps the shutter open as long as you keep your finger on the shutter release button. This is what makes the Colorsplash rock. With a LOMO LC-A, when you shoot in very low light, the camera’s diaphragm opens wide to f/2.8. This makes the depth of field (the area in focus) very narrow, and I typically shoot blurry, out of focus shots. The Colorsplash diaphragm is preset to a somewhat narrower aperture, probably f/8. When you set the camera to Bulb, the shutter stays open as long as you hold the button down. The narrow aperture limits the amount of light hitting the film and requires a longer exposure, but you get a wider depth of field and more in focus shots. The flash with colored gels is fun. You can use it for fill flash in available light to add a slight color cast to your photos. You can use the flash with instant exposure in complete darkness for typical Colorsplash shots. Or, you can set the exposure to Bulb, use the flash, and the flash will fire as the shutter closes. This gives you weird, normally exposed backgrounds with a contrasty, colorsplashed foreground. I’m still playing with different types of film. For vivid color, I’d lean towards slow, 100 speed film. I shoot 100 speed film in my LOMO by choice. With 100 speed film, the flash is only good for about 7 feet, With 400 speed film, you’ll lose a bit of color, gain a bit of grain, but increase the reach of the flash to 15 feet or so. And, in all fairness, 400 speed film is getting pretty good. 5-10 years ago, 400 speed film was a crutch to try and get an image in low light when you couldn’t use 100. Now, 400 is the standard with point and shoot cameras. If white isn’t your style, the Colorsplash comes in ice blue, red with a faux fur cover (! ), and a mean looking dark charcoal gray/black edition.